Neil Ellis Wines is owned by Neil Ellis and Hans Schroeder. Neil was making wines and consulting for various Cape wineries in the early 90s when Hans returned from Japan after 25 years away, and bought the Oude Nektar property in the Jonkershoek Valley. A natural partnership between the winemaker and the vineyard owner soon ensued, and Neil Ellis Wines was born here in 1993. On my last visit I also took in a new boutique winery that had just been built on the same property called Stark Condé Wines, also owned by the Schroeder family. Currently Neil Ellis is building a new cellar, to which he will move, as Oude Nektar will become the base for the Schroeder family and Stark Condé. I met up with Warren Ellis (right), Neil’s son and winemaker and viticulturist who took me through from the history of the estate to their plans for the future. From Piekenierskloof, a citrus and Roobois growing area at altitude, making it a very healthy growing area. 59-year-old bush vine vineyard. Open-tank fermented and 17 months in French oak, around 20% new. Fairly light colour, spicy strawberry and raspberry nose, typical Grenache nuttiness. The palate has a red fruit juiciness, with a lovely earthy mouth-feel and soft, spicy tannins. Quite light bodied, but has fine freshness married to length and intensity, adding up to a lovely food-friendly wine. 91/100. Not in UK. From Jonkershoek, fermented quite hot to bring out plummy flavours before 24 months in French oak, 75% new. A parcel selection and a barrel selection, with some fruit declassified. Gentle cedar notes to this, but only very gentle, the fruit somewhere between red plums and some juicy black berries. The palate shows the oak more prominently, with a vanilla and spice layering and a medium-bodied juiciness that has lots of tangy acidity and nicely drying, fine-grained tannins. A finely-tuned style, with lots of fruit, but restrained and elegant too. 92/100. £16.99, Costco. Warwick Estate is in the midst of an ambitious expansion programme that will not only double their cellar capacity, but which has already added extensive visitor facilities including gourmet picnics in the grounds and the ‘Big five wine safari’. Guests can take Land-Rover ‘safari’ through their vineyards to see the ‘big five’ varieties grown, so I hopped into the Land-Rover with owner Mike Ratcliffe as a wine safari guinea pig. We stopped first at the Professor Black vineyard (Mike Ratcliffe, pictured right), home of their best-selling Sauvignon Blanc. This old vineyard sits 180 metres above the winery, benefitting from constant breezes making it much cooler than the valley floor. The Professor Black is a variety of peach, and this entire mountain was planted to them at one point. Mike points out that many people describe the wine as ‘peachy’, but despite efforts to analyse if there is some scientific link between the old orchards and the vines, none can be proven. Indeed scientific research is one part of Warwick’s plans to improve all aspects of its wines in the longer term. Three dimensional modelling of soils has allowed planting that minimises weaknesses and allows reliable crops. They are also assessing vine water stress by measuring the amount of pressure required to get water out of the leaf, which equates to how much negative pressure (suction) the vine has to exert to get water from the roots to the leaves. Mike insists this is a very accurate way of measuring stress, that allows him to plot ‘stress curves’ for each variety and each vineyard, with irrigation at optimum efficiency for balanced, quality crops. Mike also stresses that here in Simonsberg conditions are very different from the rest of Stellenbosch, because it has altitude and marine exposure. The vineyards are decomposed granites, because the Simonsberg is one of only three volcanic mountains (along with Paarl and Table Mountain) – all of the others are sedimentary. The soil is rich, but planting is very dense to counteract this, and wheat is planted as a cover crop “To leach some of the energy out of the vines.” Mike also says “We threw out the concept of ‘hang time’ a long time ago.” Instead, careful monitoring of timings between flowering and veraison and between veraison and harvest, allow them to calculate exactly when they will harvest each year, “because vines are very predictable.” This is the main method Warwick Estate uses to control alcohol levels: “We harvested Merlot on 29th January this year – three weeks before others.” This tasting also took in the wines of Villafonté, the ultra-premium red wine project that is a joint venture between Warwick estate and husband and wife viticultural and winemaking team of Phil de Friese and Zelma Long from California. Clear, textural, fresh flavours with lots of citrus and just a little green, fig and herb note, and yes, a touch of peachiness. On the palate lovely weight and mid-palate texture and a fat, but finely-tuned lemony acidity. 88/100. Relatively new for Warwick (1991) 10 months in all Nevers oak, one-third new. Quite bright, focused nuttiness, with a touch of fig and crushed oatmeal smoothness. Lovely tang and orange and lemon cut, with the toasty background and ripe, fat fruit. Beautiful stuff. 90/100. Old bush vines, around 40 years old, though Mike admits increased production means a big proportion is from younger vines. Fine smoky nose, with cherry fruit and lots of spice. Juicy stuff, with light and fresh flavours, and a grippy tannic finish with a bit of backbone. Quite a serious style, but red fruity and chocolaty and above all fresh and juicy. 88/100. Cabernet Sauvignon with a touch of Petit Verdot. Very Cabernet nose, with a touch of camphor and brackeny mint leaf and herbs. The palate has tight, fine black fruit. It maintains a certain focus, with a liquorice bite that gives a chicory grip but the smooth black fruit stays focused. A savoury style that I like. 89/100. £8.99, Waitrose, £7.99, The Wine Society. Cape blend of Pinotage, Cabernet Sauvignon, merlot and 10% Syrah. There’s maybe a touch of jammy, plush weight and silky fatness to this. Real big mouthful of wine, with masses of plum and chocolate. Fine and refined. 91/100. Really clear, beautifully expressive nose with a touch of lead pencil to typically soft, leafy herb fruit and touches of tobacco and spice over ripe blackberry fruit. Fine palate, with smooth tannins and a refined core of medium-bodied fruit. 91/100. Cabernet Sauvignon, Cabernet Franc and around 10% Merlot. 20 months French oak, never more than 50%. Big plush nose, with that very characteristic herbal note that Mike celebrates as part of the Warwick terroir. Strong minty and eucalypt character. A touch of rubber, but the thick, sweet, ripe fruit powers through. Closer to a blockbuster, but retains finesse and savoury bite. £14.99, Wine Society, £17.99 in independents. 93/100. First release for this 100% Syrah. Tight, baked plum nose, with a touch of smoky bacon and great fruit sweetness coming through, a touch of green. The palate has a big fruit sweetness, with that touch of pea pod green quality persisting, but it is chocolaty and has real weight and density of fruit in the finish. 91/100. 40 cases from 1500 in UK with Wine Society. see all stockists of Warwick on wine-searcher. In the 1990s Phil and Zelma bought a property and started planting, with new techniques for dense planting, drainage and then pruning. The whole idea was to grow small vines, with no hedging of the canopy and leaf pulling, but balanced vines that would be a natural expression of the vineyard. This is a totally terroir-based project, with the vineyard divided into one hectare blocks. This is Zelma’s 10th vintage with these grapes, but says she is still surprised and still learning by what the vineyard gives. Very fine, cedary nose, with lovely plushness to the fruit. It has a tinge of green herbs and leaf tea that sits beautifully. The palate has a terrific bittersweetness, with ground coffee and such sweet, plush fruit. Fabulous fruit sweetness and plush tannins. 93/100. See all stockists of Villafonté on wine-searcher. The biggest buzz around Jordan on my visit was the recent opening of a new restaurant at the winery, run by George Jardine, one of South Africa’s top 100 chefs for the past two years who wanted to move with his family to the country. I can vouch for the terrific quality of the food after lunch there with the Jordans and a small gathering of winemakers. The Jordans’ minds were somewhat pre-occupied during my visit by a looming crisis over mining rights. A state-owned company had apparently been granted the rights to prospect for tin, zinc, lithium, lead, copper, manganese and silver on various farmlands, including Jordan’s best vineyards. Success would have given the company the rights to mine in the midst of some of the Cape’s best vineyards and most beautiful scenery. Gary Jordan (in thoughtful repose, above) was a prime mover in opposing the move. Thankfully, the application to prospect was withdrawn in March 2010, though many in the Cape remain nervous about the issue raising its very ugly head again in the future. 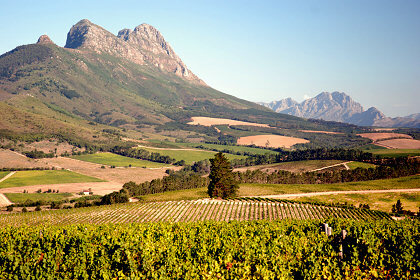 Meanwhile, winemaking goes on at one of the Cape’s most conscientious estates. The Jordan’s learned their trade in California, “Though one thing we learned from our time there,” says Gary Jordan, “is that people don’t want a degree in carpentry to drink a bottle of wine, so we are very judicious with our oak.” The Jordans have two different cellars, one dedicated to Chardonnay with Burgundian oak barrels and different temperature controls, and one for Sauvignon Blanc and red wines. The vineyards have distinct differences too, which the Jordans exploit to suit different varieties: cool, south-facing slopes for Sauvignon Blanc, east-facing clay soils for Merlot and higher slopes of clay and loam for Chardonnay for example. Skin contact for several hours. Quite mineral and tight, with a gentle herby leafiness. It has lots of cool climate finesse, the fine lemon zest fruit and fresh, pithy acidity is delicate and lovely, though aromatic and quite bold. 89/100. £7.99, SAwinesonline, Fareham, Frank Stainton. Nevers and Alliers oak, quite different to the small Burgundian coopers used on the Chardonnay. Five star Platter. Named after Gary’s father who was a shoemaker. Cabernet, Merlot and Cabernet Franc. 24 months in oak in total, though blend is made after 12. Lovely elegant fragrance, with herbs and a touch of cedar, a little minerality and touch of gamey, plummy character set against the almost floral and fennel touches. The sweetness of the fruit is delightful, but those big, ripe, spicy tannins do add some muscle making this quite full and relatively powerful, with a long, very persistent finish. Fabulous wine. 93/100. £15.99 – £17.99. Cabernet Sauvignon dominated Bordeaux blend made for the Cape Winemakers Guild charity auction (Sophie is the mother of Faith, Hope and Charity). 26-month barrel ageing. Lovely big aromatics, with some figgy, herbal quality and a certain smokiness. Very fine mineral notes. There’s an exquisite sweetness to the fruit, with that savoury cut and bittersweet cherry skin bite. 94/100. See all stockists of Jordan Estate on wine-searcher. The Meerlust farm dates back to the 1690s, with the manor house and oldest part of the cellar (part of which is visible behind winemaker Chris Williams in the photgraph, right) dating from that period. Just three kilometres from the sea at False Bay, evidence of early plantings suggest sweet white wine grapes were grown, though the wine it made was probably of indeterminate quality as its main purpose was to serve to sailors to keep scurvy at bay. It was the father of the current owner, eighth-generation Johannes Myburgh, who changed the estate from a bulk wine producer to an estate bottling its own wines. Initially a producer of only red wines, Meerlust was one of the first in the Cape to attempt a Bordeaux blend. That wine, The Rubicon, first appeared in the 1980s and went on to become a true Cape icon. Meerlust’s winemaker is Chris Williams, who worked with Michel Rolland in Bordeaux through 1997, at Château Bon Pasteur in Pomerol. But Chris also travelled around Bordeaux with Rolland, which he says “was great exposure to sampling the fruit from all across the region and doing a lot of experimentation.” Chris also mentions that there is no real culture of ‘wine consultants’ in South Africa, in terms of people like Rolland who go into established wineries and work with them to improve their operations. Chris has done a lot to improve the Rubicon, mainly in the vineyards where he stopped using some blocks that were not good enough and tightened up lots of controls. Large vineyards were broken down into smaller lots and now as much as 60% of fruit is dropped from the vine for The Rubicon. The cellar has also been gutted and replaced with smaller tanks and a gravity-flow system. However, Chris says “There is no winemaking formula. Decisions on cold-soaking, fermentation, etc. are made day by day and vintage by vintage.” Chris also has his own boutique wine label called ‘The Foundry’, also made at Meerlust, but with a production of only 2000 cases using Rhône varieties. Small, Burgundian cellar within main cellar with small tanks, hand-plunging. Fine, light colour. Nice muskiness and smokiness, with a lovely nose that is berryish and soft. Nice old vine, bracken Pinot Character in the mouth, with truffle and lovely Pinot notes that are earthy and deliciously tangy with the fresh acidity playing against nice tight tannins and spice. 90/100. £16.00. 18 months in Nevers oak., around 60% new. Around 10% Cabernet Franc in the blend. A touch of leafiness and and a solid, plumy red and black fruit. The palate has good density and a big, dry palate, with a really firm, liquoricy edge. The dark, rich fruit is edged with good acids and tannins in a leaner, more savoury style. 90/100. £16.00. Barrel fermented in old Chardonnay barrels. Lovely fresh nose, very aromatic, with some peachiness from Viognier and a little herbal lift. Very nice,ripe fruit,with delicious juiciness and a sweet finish with lots of tang and really good length. 89/100. £8.99, Wine Society. Winemaker Michael Bucholz greeted me at the historic Bergkelder cellars and visitor centre, home to Fleur du Cap, which is one of the premium brands owned by the giant Distell company. As a group, Distell only buys or grows around 20% of its production requirement as grapes, the rest they buy as wine. Such an enormous producer suffered badly when howling winds swept through Stellenbosch in November 2009, and Michael estimates they and their suppliers may have lost up to 50% of the crop. Michael says that as part of a big group there’s a whole team of viticulturists, but that doesn’t stop the company from experimenting and developing: “Around 15 years ago we started paying a lot more attention to temperatures in vineyards by sinking temperature gauges into all of our sites. This helped develop micro-climate maps that show us which sites are ideal for varieties such as Sauvignon Blanc for example, where the pyrozenes that give the green herbal zing do not ‘boil off’.” Innovation is witnessed as Distell has continued to open up new areas with the first vine plantings after this exercise. 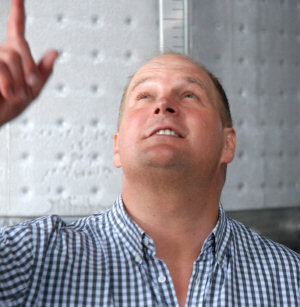 In tiny areas where the temperature mapping showed blue dots, little cool-spots were identified where Sauvignon and similar cool-climate loving varieties can flourish and give interesting flavours, like in coastal Darling and down in Cape Aghuilas too, the most southerly point in South Africa “where you can stand in the vineyard and almost touch the sea,” according to Michael. (Photo courtesy SA Times). Nice green apple fruit, quite bold and a touch of leesy weight. Quite mouth-filling wine, with weight and texture, a lot of apple tang and a pithy lemon dryness in the finish. Tangy and satisfying. 86/100. From Aughulis and Luttesville fruit, selected for this cuvee. A riper style here, with less of the pyrozene green character, though there’s still a more subtle green bean undertow. The palate has a real tang, with a juicy orange and quite fat lemony acidity, plenty of bite but texture too. 88/100. Real honey and glycerine lemon nose, with nice apricot fruit and a touch of herby lift. The palate has nicely punchy fruit, the lemony character coming through, with a certain fat and weight of nectarine skins, but although quite big (15%ABV) it doesn’t really flesh out and moves into an acid, citrus phase fairly abruptly. A clean style and a good wine. 86/100. Lemony nose with just a hint of toast and seeds, but quite neutral. The palate has a big, clean lemony breadth – it is textural and quite weighty despite being citrusy, but has a freshening character in the finish that makes it tasty, if slightly one-dimensional. 86/100. Viognier, Semillon, Sauvignon and Chardonnay in equal parts. Quite a subtle oak character, with some of the Viognier perfume coming through, but again the focus is on lemon and lime freshness and this does have a nice layering of flavours, the medium-bodied texture filling in with a lot of pithy tang on the finish. 89/100. Nice oak quality, though the oak is fairly prominent (14 months in barrel) and possibly too much so. The palate is really quite juicy, the bright apple and lemon fruit tangy, just a hint of more tropical fruit, a pineapple sweetness to the fruit showing more on the finish (though the wine is dry), the oak just adding a vanilla creaminess but bright citrusy acidity. 87/100. “If you look after Pinotage and treat it nicely it will reward you with a lovely wine, but if you don’t it will turn around and bite you. 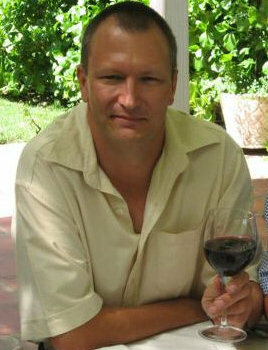 With a cab or merlot you can lose a poor wine in the blend, but my God, not with bad Pinotage,” says Michael Bucholz. Bold black cherry and smoky spiciness. The palate has juicy, mouth-filling black fruit with plenty of enjoyment in the glass. Tasty and beautifully made stuff. 87/100. Big, chocolaty, rich style of Merlot, with plummy black fruit. The palate has a dryness on the mid-palate, a touch of over-extraction possibly, but then it becomes quite juicy in the finish again, with cherry and that black chocolate richness making it chewy and tasty. 86/100. Quite a dense nose, with slightly muddy black fruit quality perhaps, not quite singing with a cassis clarity. A touch of smoky oak. On the palate nice and savoury, the black fruit bold and chewy, slightly dry on the mid palate, but again that juiciness and vitality re-emerges on the finish, making it quite juicy and chewy. 87/100. Blend of components from the best barrels, usually Cabernet or Merlot based, but not necessarily a Bordeaux blend. Named after Dr Laszlo, who fled from Romania, and established the Fleur de Cap cellar. Hugely ripe and rich nose, flooded with ripe black fruit and chocolate, a certain coffee bean darkness, but really about the plummy, maybe very slightly baked fruit. Big and juicy on the palate, with lots of chewy, quite dry tannins still and a real richness and plushness. A huge mouthful, crying out for a juicy steak. 88/100. Not made in every vintage, so no 2005 for example. A lot more sweet, coconutty oak character, almost a mint humbug character. The palate is still quite tight and tannic and dry, with lots of dense black fruit in there, but this needs a few years to loosen up. Potentially a better wine than the 2004 however. 90/100. 243g/l of residual sugar. Chenin Blanc. Nicely smoky nose, with lots of orange peel and marmalade, the honey and barley sugar botrytis coming through. Big, intensely sweet palate, with the glycerine and honey coating the mouth, with nicely creamy texture and sweet, rich apricot fruit. Lots of fruit, with vital, zesty orange and retaining really good acidity. 89/100. Gyles Webb is one of those wonderful characters with the ability to leave me feeling inspired and refreshed, even after a tiring day tramping through vineyards and tasting dozens and dozens of wines. Dashing from his highest vineyard back to the winery where Cabernet Sauvignon was arriving from one of his best blocks, to the tasting room where bottle after bottle was fetched from the cellar, an afternoon in Gyles’ company is exhausting but invigorating. Having started his winemaking life as a cellar hand at Heitz Cellars in California, Gyles returned to South Africa and bought his Stellenbosch farm in 1983, and today Thelema produces 50,000 cases. From Elgin. A little herbaceous, lightly nettly nose, but very discreet, with gooseberry and a fresh lemony quality. “It’s still too herbaceous for me,” says Giles. The palate is riven with a lemon zest fruit and real clarity. Lovely gentle pear drop notes, but absolutely clean and mineral dry. 89/100. From Elgin. Fermented in older oak. Bone dry but gives an impression of sweetness. Very nice nose, that light note of bruised pear and apple fruit, a little floral lift. The palate has mouth-filling sweetness, but again that really clear, crystalline minerality to the acidity in a fresh, vital finish. 90/100. This Elgin Viognier has ‘morphed’ into the Viognier Roussanne which will replace it. This was first crop. Gently herbaceous, with some peachy aromatics and a dry apple character. Very fresh palate, the wine staying dry if simple and a lit lemony-simple. 87/100. Slightly off dry. 12%. Beautifully floral nose, the Muscat perfume singing out, with hints of lychee and guava. Lovely palate too, just off dry, with beautiful peachy, nectarine flavours that just flood the palate. What a lovely Muscat. 89/100. Quite subtle green bean qualities, but more herbaceous than the Elgin wine. A hint of quite tropical, almost pineapple fruit. On the palate perhaps lacks a little burst of fruit, the mineral and greenish quality dominating into a very fresh finish, little notes of lychee and guava again hinting at tropicality. 89/100. The burnt orange and vanilla notes here are lovely, a hint of barley sugar, and clean melony fruit. On the palate very clean flavours, again that dry, mineral and apple character but slightly fuller than the Elgin wine, and showing a lovely freshness and length. 90/100. A treat to taste this, with its deep golden colour and slightly oxidised and cabbagey notes not detracting, and on to a still balanced palate, showing the buttery, lanolin edge and again a touch of oxidisation adding a bruised apple fruit. 88/100. Wax and lime character, with hints of paraffin and seed cake. Delightful palate too, the grapefruit pith and lime dryness of the acidity and terrific shimmering length. 91/100. 65% Cabernet Sauvignon and 35% Petit Verdot. First crop. There is a touch of vegetal quality and herbaceous quality here, a spiciness and meatiness. On the palate the black fruit emerges with sweetness and earthy depth. It is perhaps a little short, but has balance and a nicely creamy finish on the tannins. 88/100. Rounded, juicy cherry nose. A nice cedary background. The palate is dry, with a liquorice, even chicory edge to the fruit. Structured and fairly chunky, with a dustiness to the tannins and a broad, rich base of plumy fruit and chocolaty oak. Lovely savoury stuff, if the finish is verging on the austere at this stage. It needs some time, but has great structure and concentration. 90/100. Beautifully ripe, black, concentrated silky black fruit. A dusty quality here again, of that concentrated, composed, quite muscular but sweet black fruit. The palate has delicious fruit, a huge sweet core driving through the wine, the tannins dry and touching on the austere again, but this is all about the future with savoury, liquorice tinged fruit and great acidity. Fabulous, natural concentration and balance. 93/100. Gamier, with mint and eucalypt in the background. A touch dulled, but a chocolaty ripeness of fruit comes through. The palate has a silky weight, with really nice, full fruit on the mid-palate and delightful smoothness to the tannins. 93/100. Ripe, ripe nose, with the opulent berry and plum tomato sweetness apparent. The palate has that same, silky, glossy depth to the fruit, with plum and very smooth tannins, the finish long and silky. A touch of coffee and fine length here, that dustiness of the 2007 now smoothed into an elegant savoury dryness. 94/100. What connects Flagstone, one of the Cape’s quirkiest and most experimental wine companies and Kumala, one of its biggest mass-market brands? The answer is Bruce Jack (seeking divine inspiration, right). It was something of a shock in February 2008 when it was announced that Constellation Brands, the world’s biggest wine company, had bought Flagstone. 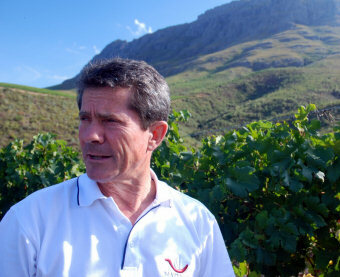 Under Bruce Jack, Flagstone had developed a reputation as one of the Cape’s best, but most idiosyncratic wineries producing mould-breaking wines of very high quality. Quite how that would fit in with the uber-commercial Constellation, masters of big-selling world wine brands, was baffling. 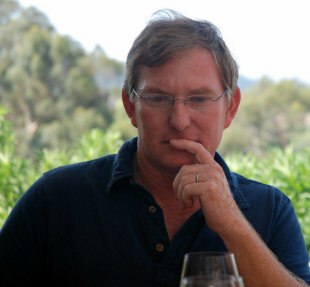 Even more surprising was the news that as part of the takeover deal, Bruce Jack had also agreed to become Constellation’s winemaking supremo in South Africa, in charge of both brands. Launched in 1995 into the UK, Kumala has been part of South Africa’s emergence onto the world wine stage. Last year, 31.5 million bottles were produced – “the same as the number of seconds in a year,” quips Bruce, but is staggering to think of one bottle per second as the production rate. The winery facility I visited is for the Flagstone wines: blending and bottling for Kumala is done by 12 suppliers, with wine also shipped to Bristol in bulk for bottling in the biggest bottling hall in Europe, Constellation’s facility at Avonmouth. Bruce has made it his mission to retain Flagstone’s quirkiness and to improve Kumala. Indeed he says that Constellation have been supportive in both aims, which makes the decision of 2008 a little easier to understand. “Kumala is market led,” says Bruce, “whilst Flagstone is nerd led”. Perhaps Constellation’s willingness to let the Flagstone brand continue to be made by a ‘nerd’ for ‘nerds’ is because Bruce Jack is having such an impact on Kumala. It has grown 20% by volume and 19% by value in the past 18 months, its 31.5 million bottles dwarfing Flagstone’s sizeable 450,000 production. And quality is good too: as an over-familiar big brand it had been a long time since I sat down to really taste the Kumala range, and this tasting provided a very pleasant surprise. Lovely fresh nose, lots of vivacious fruit and zing, with a nice herbal quality. The palate has plenty of fruit and plenty of punchy, leafy, vibrant citrus and just hints at a tropical sweetness. Lovely stuff. 87/100. Elim fruit (“place of God” from the old testament). Fantastically vibrant nose, with quite delicate pea-shoot and leafy green herb notes. Lovely fresh citrus fruit, with lots of finesse. 89/100. Single vineyard in Worcester, over 15 years old. Fantastic nose, with a suede-like density to the fruit that forms a deep, deep pool of silky black and red fruit. Fills the palate with extraordinary sweet fruit, the softest tannin structure and the purity of fruit coming through beautifully. 92/100. £14.99 Wimbledon Wine Merchants and independents. 2006 vintage in Wine Society. Wonderfully, ripe, creamy, chocolaty black fruit. Lots of spice, lots of chocolate, lots of silkiness, terrifically plush, but edged with a sinewy, liquorice tight edge. Fabulous stuff. 93/100. Very fragrant, floral and very spicy aromatics with clove and cinnamon, a delightfully herbal quality and tight, dusty black fruit. Immense fruit sweetness, with blackcurrant and bittersweet dark chocolate racing across the tongue. The tannins are fine, and though this has density and intense concentration, there is a freshening liquorice edge and clean acidity. Long and tantalising stuff. 92/100. Aromatic and sweet nose, with apple fruit and some pear skin grip. Nice mouth-feel and richness, with plenty of tang and vibrancy, a flattering touch of RS and nicely balanced acidity. 85/100. Aromatic, with a bit of vivacious style, quite punchy. The palate has a certain richness and glycerine quality, much more lemony fruit, and a clean, quite dry finish with a bit of bitter orangey tang. 86/100. Soft, ripe, appealing nose, a touch of leafiness and red berry fruits. The palate has a nicely dry acidity, but the soft strawberry fruit and juiciness is very pleasant. 84/100. Peppery, spicy ripe cherry and black berry fruit. Nice floral lift too. The palate has real fruit sweetness and juiciness, a particularly easy-drinking, sweeter style, but not cloying. Good, fresh acidity. 84/100. Fairly subdued nose, with quite soft black fruit. Sweet and rich on the palate, with a bit of earthy grip, but really about the soft, creamy fruit and finishing sweetness, but drinkable and balanced by good acidity. 84/100. Journey’s End is a new wine name with vineyards just five kilometres from the sea at False Bay, with wonderful views over to Cape Point. It is owned by Roger Gabb, who owned Western Wines and its Kumala brand, which he sold to the Canadian company Vincor (before it in turn was acquired by the giant Constellation Brands). Originally the farm supplied a £14.99 wine to Kumala, but when Roger sold the company he kept this farm and re-launched under the Journey’s End label. The focus here is on single vineyard wines from estate fruit. Though not organic, there are minimum treatments: “We sprayed four times this year when most guys are spraying 14 or 15 times,” says viticulturist Paul Fourie. A big barley cover crop helps reduce soil erosion on steep slopes and controls weeds. Paul also uses a concoction that includes molasses and chilli sauce that he paints onto vines to stop ants from going onto the vines, which in turn stops mealy bug, the creatures that spread virus between vines. Along with winemaker Leon Esterhuizen, Paul is also working with local environmentalists to reintroduce owls and ducks to control snails and other pests, and light quad-bikes are used around the vineyards which have less impact and use less fuel than tractors. There’s a programme to eradicate blue gums (imported from Australia in the past) and allow the native fynbos to re-establish. In terms of the wines, Leon Esterhuizen (left) grew up in Robertson before graduating in winemaking from Stellenbosch, then moving to Napa to work at Chappelle Estate, then to Yecla in Spain to work with Bodegas Castaño before starting at Journey’s End in 2006. All of these influences are being used to coax distinct expressions from the various varieties and vineyard plots. Open fermenters on a very cool ferment, barrel aged. Very much spice driven, with tobacco and leafy notes and a dustiness to the black fruit. The palate has a little sweetness, with a sour cherry and bittersweet plum skins character, again retaining that juiciness and nicely balanced acid and tannins, in a very savoury style. 89/100. 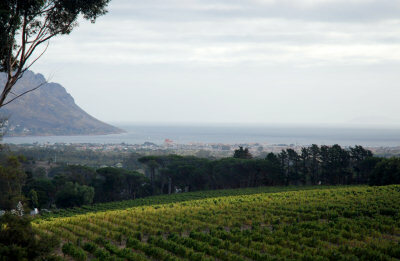 23rd November 2009 is a date that will be etched in the minds of the Cape’s winemakers. 130mph winds howled through the winelands, destroying 50% of the crop for some producers, even 100% for some unlucky sites. Then a steady, promising late growing season was suddenly turned on its head when a searing heat wave struck in mid February 2010, leading to 30C+, sometimes even 40C+ temperatures right through the harvest period. Maybe the stoic, resolute mentality of South African winemakers was formed by history: the great trek, a constant moving-on, determined to stand on your own two feet. But when I discussed this most difficult vintage over dinner with three young winemakers there was a collective shrug of the shoulders and sense of steely determination that they will learn from the experience and move on. 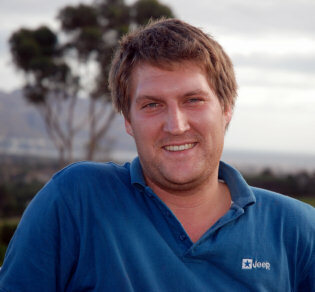 Matthew Van Herbden is winemaker and viticulturist at Uva Mira. 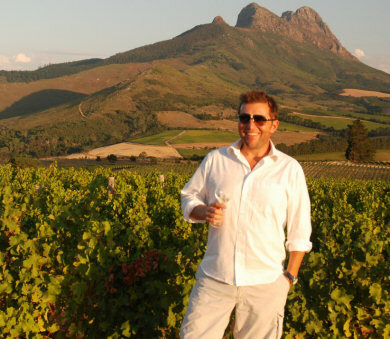 “South Africans have big egos, but we need to promote brand South Africa and not just our own wines,” he says candidly. He stresses that his are ‘terroir wines’, both single vineyard wines and blends, but always trying to express vineyard sites – including one of the Cape’s highest at 650 metres. Also joining me was Gunter Schultz, viticulturist, winemaker, and olive grower for Kleinood Estate (who produce the Tamberskloof label) which is specialising in Viognier, Syrah and Mourvèdre. “It’s a cliché, but it’s all about the vineyard and the vintage,” he says, and to that end he is farming organically, though not certified as such. 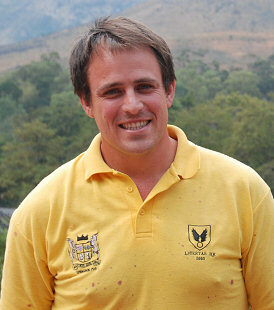 Finally, Kobie Lochner from Rust en Vrede, where Shiraz is the focus. A word also for the absolutely superb restaurant at Rust en Vrede under Chef David Higgs, which is arguably the best in the Cape. Also included here, a couple of wines from the excellent Cabernet Sauvignon-focused Le Riche estate, tasted over a lunch with Yvonne Le Riche. A little ageing in older French oak, natural yeasts, three pickings, the first very early to keep alcohol low and stop Viognier’s cloying tendency. Quite a discrete, lightly waxy and lemony nose, with some clean, under-ripe pear fruit. Lovely freshness, with really good acidity and though it has texture, it is not oily or heavy. 90/100. UK Agent is Artisan Wines, but see all stockists on wine-searcher. 11 months in older barrels, from an elevated site. Matthew says this gives minerality. Very clean, mineral nose with just a trace of honey. The palate has a beautiful pitch, the fruit crystal clear and the acidity a point. Beautifully pitched wine. 91/100. See all stockists on wine-searcher. Co-ferment of Syrah and Viognier grapes that are picked together. Big, meaty, peppery nose, with a certain density and just a little kirsch-like lift. The palate has a bloody and gamey edge to very ripe, but not heavy fruit. It keeps fine acidity and very fine tannins. 91/100. Big, immediately ripe and rich, chocolaty nose, with lots of blueberry and fat, sweet plum. there is some pepper and spice too. The sweet, full ripeness has huge depth, with black fruit, sweetness, depth and still a nice edge of structure. 91/100. 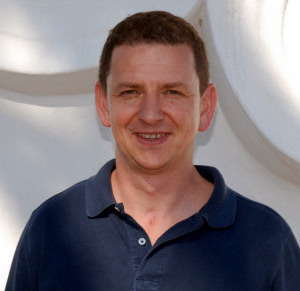 Rust en Vrede’s UK agent is Seckford Agencies. See all stockists on wine-searcher. Another big, sweet nose with masses of blackberry and sweet, very fine fruit, the fruit is rich and ripe, just beautiful. 92/100. Fruit from all the specific single vineyard blocks. Big and meaty, with smoky and cedary nuances and a bloody, gamey depth. Fantastic depth of fruit. There’s a silky finesse to the tannins, with very fine balance. Superb length and clarity again in a very fine wine. 93/100. Cabernet Sauvignon dominated blend with Syrah and Merlot. Big, cedary, brackeny and earthy nose that is highly aromatic. A touch of charcoally schist but fine cassis fruit. The palate has an opulence and suede-like, very silky tannins. Lovely silkiness and glycerine richness, but despite that and the alcohol (15.5ABV) it does have balance and elegance. 92/100. Named after the year the estate was founded. 54% Shiraz with Cabernet, 3600 bottles produced. A big, dusty, smoky black fruit nose. Some meatiness, but still about the fruit. The oak is prominent on nose and palate, a heavy sheen of vanilla and coffee but the fruit is lovely. Huge, but delicious. 92/100. Beautiful, lifted perfume with basil and sage and some gamy perfume. Lovely purity on the palate, with racy red fruit. Plenty of chocolate and depth, but great length. 92/100. French oak, 30% new, for 18 months. Slightly baked, maybe slightly reduced quality here. A certain meatiness. On the palate a lot more sweetness and voluptuous roundness comes through. The palate has a lovely fruit purity, the tannins are very plush, the spiciness really grips but a chocolaty, dark fruit coats the palate, the acidity stays pert and this has a big impact on the finish with mouthfilling weight but clarity too. 91/100. £13 – £16, UK Agent for Le Riche is Boutinot. See all stockists on wine-searcher. Comes from older vines giving smaller berries, much of it bush vine. Open fermenters with punch down. Then capped and macerates at low temperature for two weeks. French oak, 70% new, for 24 months. Slightly more light and shade about this on the nose, less of the baked plummy note. More cedary finesse and a touch of lovely cab leafiness. The palate has lovely juicy freshness and really nice fruit, it has a great blackcurrant tartness to the fruit that keeps it nimble on the mid-palate, and the spice and chocolate of the regular wine pushes in, giving this lovely plushness too. 92/100. £16 – £20.